According to ChemOrbis, PVC prices in Asia have witnessed increases recently on the back of restricted supply, defying the generally bearish trend in place in most polymer markets. Although players in the key Indian market are generally anticipating a fresh round of hikes, rising export activity in China may alter the market outlook by helping to alleviate supply concerns. Chinese sellers are starting to show greater interest in export markets following several weeks in which most Chinese producers refrained from exports owing to the better netbacks obtainable in the local market. Local prices in China were buoyed by the fact that production costs for acetylene PVC, which constitutes the large majority of China’s PVC production, have remained largely unchanged while steep decreases in ethylene costs gave producers of conventional PVC a cost advantage over acetylene based producers. 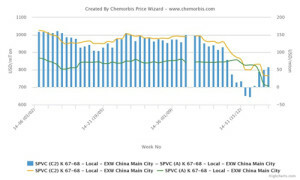 According to data from ChemOrbis Price Index, ethylene based PVC prices on an ex-warehouse China basis traded at a discount to acetylene based PVC in the last few weeks of December for the first time since 2008. This was a marked reversal of the prevailing trend for most of 2014, which saw ethylene based PVC trade at record high premiums of around $100-160/ton over acetylene based PVC for most of the year. In January, acetylene based PVC producers implemented price reductions sufficient to push the premium for ethylene based PVC back into the $50-60/ton range; although many players speculated that acetylene based producers restored price competitiveness at the cost of significant margin erosion. 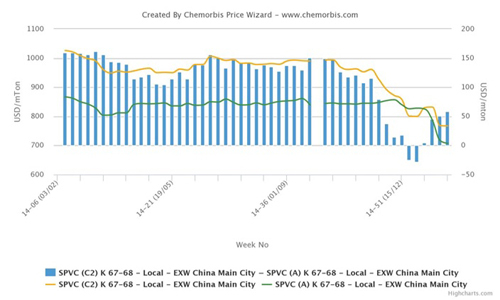 As per ChemOrbis, a trader based in Malaysia said, “We were surprised to receive lower offers for acetylene based PVC as our suppliers had been insisting on higher prices in the past month only to lower their offers now even as conventional PVC producers are raising their prices. Buyers are showing resistance to these offers and we feel that limited demand may undermine the recent upward movement in PVC prices.” A pipe manufacturer in Malaysia reported purchasing some Thai and ethylene based Chinese PVC while adding that they found the offer they received for acetylene based PVC to be too high to accept. “We secured some material to ensure smooth supplies, but we do not want to purchase in large amounts as we feel that the market direction is cloudy these days,” the buyer stated.